Don't even think of messing with a replica Mongolian T-Rex. 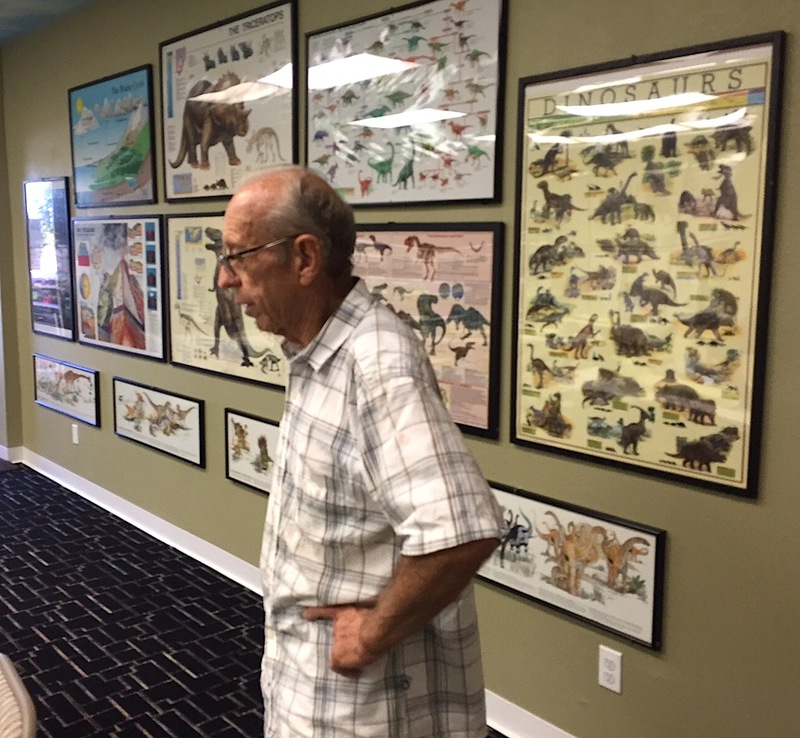 Keith Roynon surveys some of the materials in one of the museum education rooms. 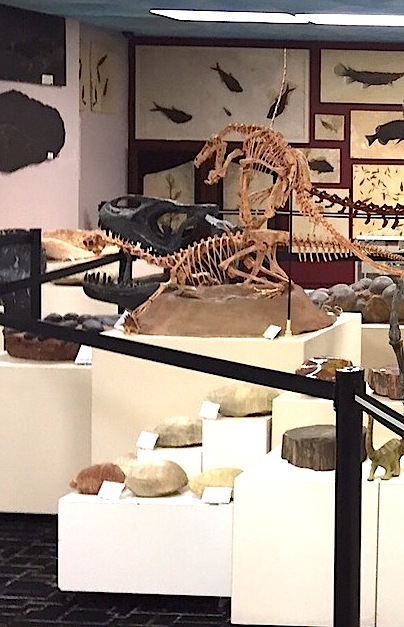 Don’t look now Indiana Jones, but Keith and Judy Roynon and their highly eclectic, totally jaw-dropping Roynon Museum of Earth Sciences and Paleontology is gaining on you. The Roynon’s’ huge, private collection of fossils from around the world along with rocks and pre-historic artifacts once filled their South Escondido home. It brought in school groups by the busload for about 15 years. Museum official Jeannie Nutter estimated that 20,000 school children passed through the home-turned-museum this century. What’s a few months, when one has hundreds of thousands of years of remnants to house safely? A native of Santa Cruz, Keith Roynon is an energetic former antique companies owner who took a BS degree from Seattle Pacific University. He attended University of Washington’s geology graduate student until he ran of of money, something he still talks about with obvious regret. More of the Roynon Museum collection. Roynon became a very successful business person and antique dealer along with his wife Judy, who taught at Escondido elementary schools . All the while, Roynon continued his passion for the Indiana Jones-like task of collecting fossils and working with rocks and earth sciences for 50 years. The huge Roynon collection is believed to be the largest private collection of such materials this side of Denver. Perhaps it’s smaller than the Smithsonian National Museum of Natural History and the American Museum of Natural History in New York, but if this were a class, it wouldn’t take long to call the roll. In any event, Roynon and company were faced with the task of having a whole lot of bones and rocks looking for a place to go. Demolition and remodeling for the new museum took place in August. 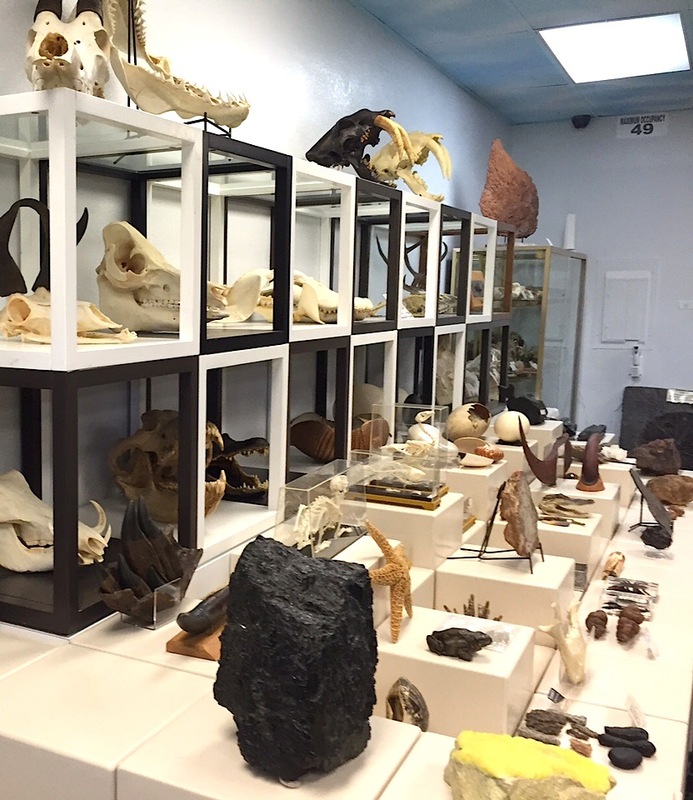 A soft opening, if one can say that of such a grandiose collection of fossils and stuff, took place on Sept. 12. With little fanfare, the museum began operations at a former medical and health industries office that had contained the likes of dentists and a Covered California, or Obamaacre, office. A grand opening party started the publicity flowing like lava from a Hawaiian volcano with 2,500 people attending, according to Roynon. Work continued last week even as the museum along with intriguing gift shop started taking in the bewildered folks just passing by as well as students and fellow travelers. Roynon’s operation is a non-profit 501(c) enterprise. To defray costs, admission costs $12 for adults, $10 for military with ID and seniors, $8 for youth ages 5 to 17 and $5 for children 2-to-4 years old. The museum at 457 E. Grand Ave. is open 1 p.m. to 5 p.m. weekdays, 10 a.m. to 6 p.m. on weekends. Ticket sales stop one hour prior to closing. Thanks to the soft opening of a place with such hard objects like dinosaur eggs and a Mongolian T-Rex replica model that fills the main room, human foot traffic has been slow, but picking up pace. Elizabeth Lewis supervises grandkids Sebastian Lewis, 3, and Robert Lewis, 4. 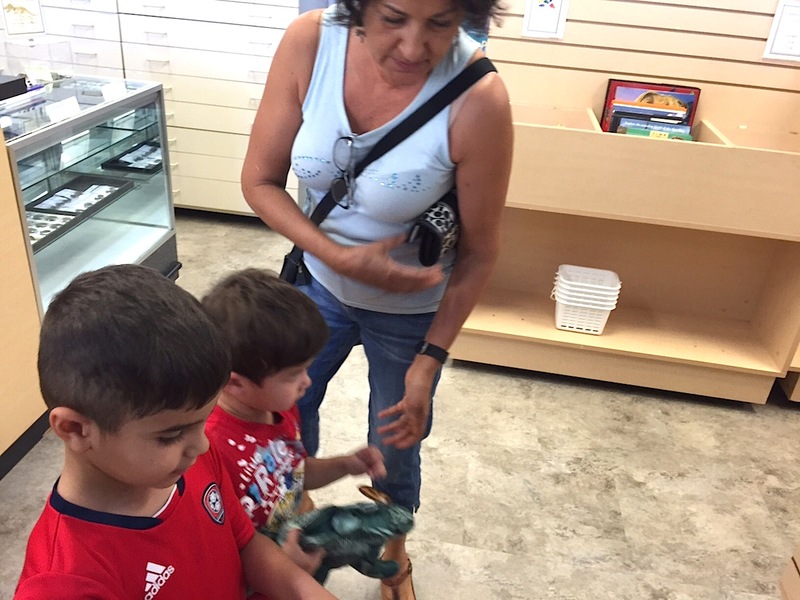 Elizabeth Lewis tried to curb in the raucous enthusiasm of grandchildren Sebastian Lewis, 3, and Robert Lewis, 4, so they could buy a few knick-knacks in the gift shop. They passed by the likes of Tarbosaurus, “a genus of tyrannosaurid dinosaur that flourished in Asia about 70 million years ago, at the end of the Late Cretaceous Period,” according to Wikipedia. They saw what is believed to be one of the largest collection of dinosaur eggs in the nation and world. The replica prehistoric Siberian bear may amuse if it doesn’t alarm first. The crazy prehistoric fish fossils might as well be from another world. All that and they one gets started on the earth science collection and rock rooms. Don’t look now, these guys may be gaining on you. Actually, Judy Roynon, museum vice-president, may be better known to some as longtime Escondido Union School District teacher. With five decades at local schools, she now heads the home economics program and pitches in at L.R. Green Elementary School on Las palmas Avenue. To find out more about the fun and venue, visit http://www.roynonmuseum.org/ or call (442) 999-4449. 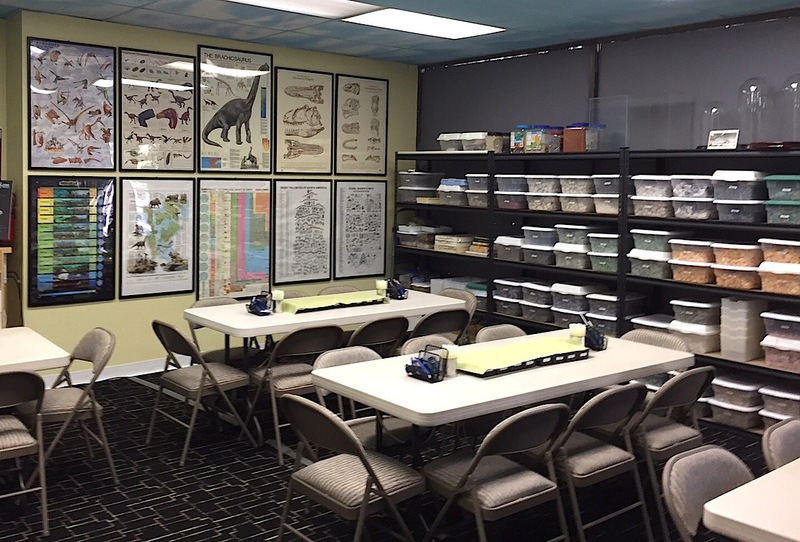 Earth sciences and education room.